Saturdays @ Noon at the G.A.R. 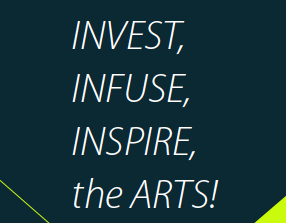 Kent County Arts Council Invest, Infuse, Inspire the Arts for All. There will be a very important transition taking place in Chestertown at the stroke of midnight or thereabouts on December 31, 2017. A significant changing of the guards at the Kent County Arts Council will happen when Director Leslie Prince Raimond will formally step down and turn the organization over to her successor, John Schratwieser. If this were just a time to celebrate Leslie’s achievements during her tenure in promoting the arts, it would be reason alone to justify a major community celebration of gratitude. But, in many ways, that is only half the story. For it was Leslie, and her late husband, Vince, that were directly responsible for the creation of the Kent County Arts Council thirty-five years ago. And during their time at the wheel, this county saw an explosion of art creation and performance in the visual arts, community theater, music, poetry, dance, and creative writing. It was the combined forces of the Raimond family that have has lead to the region to an unprecedented level of maturity in arts programming to make it one of the Mid-Atlantic’s “go-to” rural arts scenes. So it was for that very reason that the Spy was all the more eager to talk to Leslie and John about this important transition, and just as importantly, how they plan to use it as an opportunity to bring back the Fine Arts Building on Spring Street as a hub for the arts in Kent County and over time create studio space for local and visiting artists. “Songs For Our Future” is pleased to announce that we have added a second show for the next performance in our Songs for Our Future series, a Concert to Highlight Climate Change & Clean Energy. In addition to the show originally planned for Friday, March 3 at 8:00 p.m., we are adding a show on Sunday, March 5 at 3:00 p.m. with all the same music and special guests. Friday, March 3 at 8:00 p.m.
$15 suggested donation ($10 students). Reserve seats for all upcoming shows via EventBrite. All donations will be taken at the door. If your plans change, please return to the site to cancel your reservations to accommodate someone on the waiting list. All proceeds will benefit 350.org. 350.org is building a global grassroots climate movement that can hold leaders accountable to the realities of science and the principles of justice. 350.org was founded by a group of university friends in the U.S. along with author Bill McKibben, who wrote one of the first books on global warming for the general public. Today, 350.org works in almost every country in the world on campaigns like fighting coal power plants in India, stopping the Keystone XL pipeline in the U.S, and divesting public institutions everywhere from fossil fuels. All of their work leverages people power to dismantle the influence and infrastructure of the fossil fuel industry, and to develop people-centric solutions to the climate crisis. 350.org is a 501(c)(3) organization. Your donation is tax deductible to the extent permitted by law. The first two shows in this series were sold out, standing-room only events. They concert series raised $2,775 at the February concert to support the work of the National Immigration Law Center to protect the immigrant community. Watch a video of the previous concert courtesy of The Chestertown Spy. Please join us for 12th Annual Women Helping Women at the Garfiled Center for the Arts on March 15, 2017 at 7:00 PM – 10:00 pm. The theme for this year’s concert is SHINE A LIGHT! This concert always sells out! Please purchase tickets EARLY! Those of you who have been with us for the entire journey of WHW know how far we’ve come. The concert is a joyful celebration for our performers and the audience too. The clinic has a core group of “Angels” who provide for Maria both financially and with hands on assistance. The Garfield Family welcomes us with open arms and invaluable support each year. Francoise Sullivan of Moo Productions continues to manage our Facebook page and the website for Women Helping Women. Sue Matthews and Joe Holt go above and beyond guiding the production to the stage. This year, in addition to our fundraising efforts for the Marydel free clinic, Maria wanted to reach out to our local community and SHINE A LIGHT on a serious public health issue – the Opioid and Heroin Epidemic – devastating our families on the Eastern Shore. Since 1986, For All Seasons has provided mental health treatment and crisis services to men, women, children and families in the five counties of the Mid-Shore (Talbot, Dorchester, Caroline, Queen Anne’s and Kent Counties) regardless of one’s ability to pay. For All Seasons recently announced a new partnership with Dr. Eric Ciganek and Corsica River Substance Use Disorder Services in their Chestertown office – providing mental health, substance use disorder and Medication Assisted Treatment. Funds raised by WHW will help provide services to community members regardless of their ability to pay. Women Helping Women is a private account created solely for the collection of funds for this event. 100% of donations and 80% of ticket sales used for Dr. Boria’s Marydel Clinic and a portion for For All Seasons, Inc.
We spent Wednesday afternoon in the company of some aspiring young artists at Kent County Middle School. These 6th Graders are working on panels to adorn the first floor front windows of the Raimond Arts Building during construction. The big "reveal" will be First Friday May 4 during Chestertown’s First Friday festivities. More soon!!! digital marketing by fir productions inc. Copyright Kent County Arts Council, Inc. All Rights Reserved.